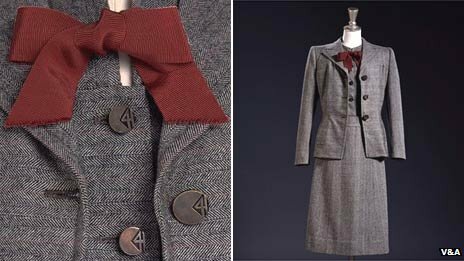 Ever since I was a teenager I was interested in vintage clothes and one of my favourite periods was the 1940s. I used to particularly seek out the Utility brand, with its distinctive CC41 tag, in order to buy clothes made for war-time Britain. The brand represented a well-designed, price controlled product which I found appealing. Good quality, lasting, fashion for the masses. I was attracted to the styling, quality, and classic design. Also the colours appealed to me as having a nice “old-fashioned” feel, and an appropriate one in the 1970s. Here are a charming set of Utility clothes modelled by, I am guessing, ordinary women, on the streets of Bloomsbury. I love this series – so similar to the kind of pictures you find on blog today (I am not sure why they are all looking to the right). A head scarf – tied at the front in the 1940s turban style – gloves, and essentially practical shoes complete the outfit. The one on the right – the young woman’s suit, required 18 coupons (see below). Prior to the Second World War mass-produced clothes were becoming more available at prices that could be afforded by ordinary working people. Once the war started fashion was seen as frivolous as most fabric was requisitioned for military purposes. Clothes rationing came into effect in Britain from 1 June 1941. It lasted, albeit in a gradually reduced format, until March 1949. Clothes produced for the civilian population had to pared down, simplified and stingy on cloth. 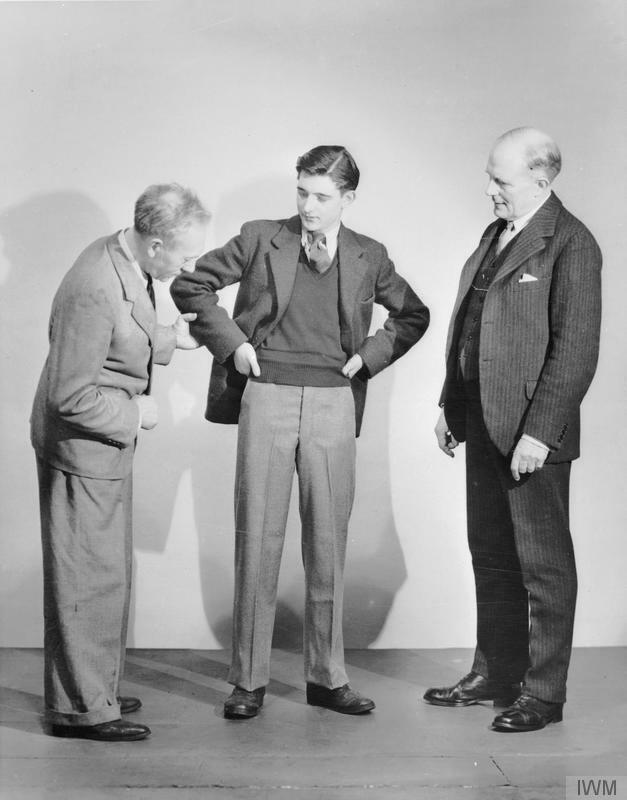 As a result major designers such as Hardy Amis and Digby Morton worked with the government to design clothes with small patterns, fewer pleats and pockets, and for men’s tailoring there were specific rules – here are some from the Making of Civilian Clothing (Restrictions) Order 1942 and 1943. As with food rationing, the main aim of the scheme was to ensure fair shares. But it was also intended to reduce consumer spending, to free up valuable factory space and release workers for the war industries. When buying new clothes, the shopper had to hand over coupons with a ‘points’ value as well as money. Each item of clothing had a points value, usually displayed alongside the price. The more fabric and labour that was needed to produce a garment, the more points needed. Eleven coupons were required for a dress. Everyone was initially given a book of 66 coupons to buy new clothes for a year. This was cut to 48 in 1942 and 36 in 1943. Second hand clothes were not rationed. The WVS set up exchanges so women could swap clothes that didn’t fit or they were bored with. Clothes were handed down from one child to the next or sold to other families. In fact fewer points were required, recognising not just that less cloth was required, but also that children grew quickly. Pregnant women received extra points for maternity and baby clothes. Patching and repairing clothes was encouraged by the Make Do and Mend campaign. At this time many women knew how to darn a sock and making your own clothes, or cutting up Dad’s prewar suit to make something fresh, became very popular. Unravelling old jerseys to knit up new ones became a national pastime. They used furnishing fabrics until these were rationed too, after which blackout material and parachute silk were some of the few fabrics that were recycled into evening dresses and lingerie. And – the reason for this post – opening today (until 31 August 2015) there is an exhibition on Fashion on the Ration at the Imperial War Museum. I can’t wait to see it. And here is a question – If you had to go for a year with 66, or indeed 36, points, do you think you could have done it? What would you have bought, and what would you have sewn to eek it out? Wonderful piece, K. I also didn’t know so many details of the rationing system. I would have been knitting and reknitting everything knittable. I also once sewed a jacket from upholstery fabric and a (reversible!) dress from old sheets with yellow flowers on them, when I was a student. 🙂 I also like the idea of exchanges with other women, as I enjoy wearing second-hand clothing and shoes, although of course it would have been difficult to be so restricted in general. Loved this post, so interesting! I am curious about people’s lifestyle during the WW2. I find that people can be very inventive in times of restrictions! You just reminded me of The Night Watch, a tv film of a Sarah Waters novel, in which the women all looked great. If I was to go back in time, I’d probably wear second-hand clothes and a head scarf like Rosie the Riveter then spend the coupons on warm, woolly things for the kids. Which would itch them, no doubt! And you would look great, no doubt! In fact I feel the Hilda Ogden headscarf must be due a comeback quite soon. Personally I like wearing the Queen’s style of scarf (tied under the chin) too, but only when its raining and no one is looking. Mum made many of her own clothes, she was Australian, and I’m not sure how rationing worked there, but she was still angry about The New Look as the lowered hem lengths meant more fabric, and in a time of shortage too. Thank you for this post, it is very interesting! I think I would have tried to sew / refashion the items I can (i.e.. skirts, coats) and save the coupons for items I cannot make like shoes, stockings…The swapping would make a lot of sense especially during this period. I’ll have to come into town to catch this exhibition – rationing would be a nightmare for me! I assume that fabric was also rationed – it wasn’t as though one could run to a store to buy a dress length. I would go bonkers without sewing to distract and amuse me… I suppose one would have to channel one’s creative urges into other pastimes. It’s really worth going to see although its £10. Fabric was rationed too I am afraid. But there was lots of opportunity to make coats from blankets, underwear from parchute silk and new fabric from old clothes.